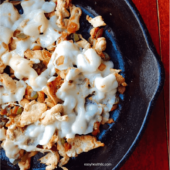 Low Carb Chicken Philly Cheesesteak is the perfect recipe for a delicious, health and quick-fix meal. In less than 30 minutes, you can enjoy a diabetes-friendly meal the whole family will love. CLICK BELOW FOR THE LOW CARB CHEESESTEAK .